Use this page to ensure the Spotlight Diagnostic Server is appropriately configured for Internet access. The following Spotlight services require Internet access on the Spotlight Diagnostic Server. Enable Auto Update so the Spotlight Diagnostic Server will receive minor updates (scripts and configuration) automatically. Monitor Spotlight connections in a web browser or Spotlight Cloud Mobile. Upload performance data for health check analysis. See Upload to the Spotlight Cloud. Ensure the settings on this screen are appropriate to the settings of your local environment. Note: After the Spotlight Diagnostic Server is installed, restart the Spotlight Diagnostic Server after changes are made. 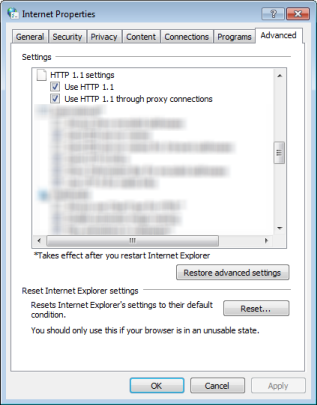 Ensure Use HTTP 1.1 and Use HTTP 1.1 through proxy connections are selected. An outgoing HTTPS connection to the following URL is used to retrieve updates. Enabling of Auto-update does not open a port that allows incoming connections. Spotlight Cloud requires incoming and outgoing HTTPS connections to the following URLs. To verify access to the Spotlight Cloud, open a web browser on the Spotlight Diagnostic Server host and look up these URLs. https://www.spotlightessentials.com Successful display of the Spotlight Cloud web site confirms HTTPS port 443 is open. https://api.spotlightessentials.com Successful display of the text “Welcome to Spotlight Web API!” confirms access for uploading.